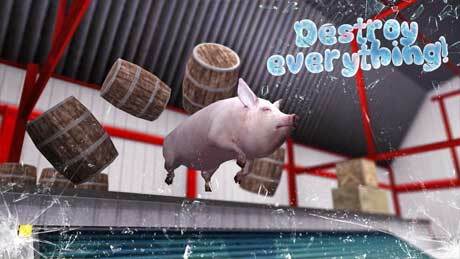 The craziest Pig game available on IOS! 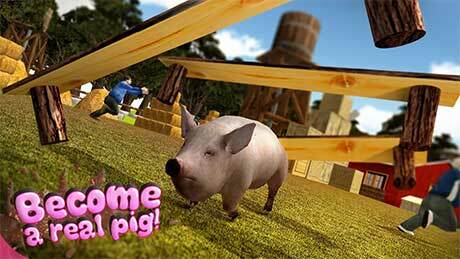 Play as a real crazy pig – run, destroy, demolish and make the biggest rampage this world has ever seen. There are five locations. First, the forest were you smash some objects and learn the game. Second, farm with animals, people and crazy missions to complete. Third, huge farm with cornfield and tons of stuff to demolish and animals to scare. Fourth, warehouse where you’re about to stop whatever they are doing inside and make everyone cry. And the last one is a huge city where you demolish gas stations, houses and make the final mess. In the house there is a rotating time clock. When you run into it, you can activate time challenge mode. 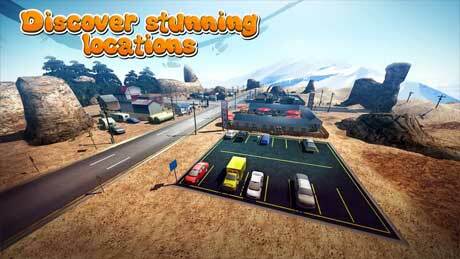 In this mode you have to destroy as many objects and do as many interactions as fast as possible. For the points you earn the stars and more gold. When you press Tap to play button in the menu you always go to the scene where you can change your pig and dress it as you like, using blue arrows on the both sides of the pig and buttons on the top of the screen. You can use the joystick, on the left to move your pig, jump button on the right to make it fly and swipe to look around. You can use the hit button on the right to smash objects with your awesome pig power.